Fall signals the end of freshly picked summer fruits, rhubarb and blueberries, and the like. But if you’re like guest blogger Bruce White, historian and MHS Press author, you’ll pull out your preserves–frozen or canned for the season–to prolong the tastes of summer. My grandmother’s cooking never quite lived up to her own standards. The humidity or ambient temperature was never quite right. The stove ran a little too hot or too cold. She’d apologize when the food was served. But the truth was there was never any reason to apologize. Her pie crust was delectably flaky, achieved through the right combination of flour, salt, lard or shortening, and a sprinkling of cold water—water measured out in eight or nine tablespoonfuls, a spoonful at a time from a coffee cup of ice water. There might of course be people who did not like apple pie, or gooseberry pie, or even “rhubarb pie deluxe,” made with a meringue top. Gooseberries were an acquired taste, and some people insisted on wrecking a good rhubarb pie with strawberries. My grandfather had a sweet tooth, so my grandmother made a lot of pies, jams, and jellies. She grew raspberries in the side yard of their home on the edge of Zimmerman, a small town, now a Twin Cities suburb, in Sherburne County. And after my grandfather, a retired Methodist minister, would return from one of his jaunts off to visit former parishioners in Wisconsin, Minnesota, or Iowa, crates of other fruits would appear, demanding to be preserved for the winter ahead. My grandfather even sprinkled sugar on top of fresh tomato slices, so sweet tomato preserves (jam, really) made sense. They too were an acquired taste and not one a young boy would usually like. But tomatoes are fruit aren’t they? I remember liking tomato preserves on toast with a breakfast of bacon and eggs. The eggs were fried briefly in some of the bacon fat, then covered and steamed gently with a little water until the yolks had just become hard, the way I liked them. As I recall it was important to grind some fresh pepper on the egg before covering it to steam. Most of my grandmother’s foods, as simple as they were, contained a great deal more than the mere ingredients. And this too was a reflection of her personality. She made a good mincemeat pie, but she did not mince words. She spoke in pungent phrases and sentences, gleaned from a lifetime of reading, that seemed to summarize a great deal in a few words, delivered with a sly smile. Did “the boys” (my brother and I) want to have ice cream on top of the rhubarb pie deluxe, or was that “gilding the lily”? (Yes, we did, and no, it was not.) Some visiting cousin might not eat the food that was put in front of him because, after all, “you can lead a horse to water, but you can’t make him drink.” If a boy or girl fought over the chair where someone else wanted to sit at the table, just to prevent that someone else from sitting there, she would caution against being “a dog in the manger.” And if “the boys” got a bit too pompous for their young ages, you might hear her say, “Oh I am Sir Oracle and when I ope my lips let no dog bark” (from “The Merchant of Venice,” act 1, scene 1), which at least made us pause. At the end of a special meal, especially if she herself was a guest and not the cook, she would quote, with a smile and a sideways wave of her right thumb, from something she had read long ago,“Serenely full the epicure may say, fate cannot harm me for I have dined today.” It wasn’t until much later that I ran across the “serenely full” line in Marge Kreidberg’s MHS Press book, Food on the Frontier (page 234), in a quotation from the English writer Sidney Smith’s nineteenth-century rhymed recipe for potato salad. My grandmother had an eye for a good line. Even now I am full, serenely, of the memories of her food and the words that went with it. Wash rhubarb and dry carefully. Melt butter in saucepan, adding 1 cup sugar and rhubarb. Cook until rhubarb is softened and sugar is melted, stirring carefully. Add egg yolks slightly beaten to remaining 1/4 cup sugar mixed with flour. Stir gradually into hot mixture and cook a few minutes, until jelly-like. Remove and cool. 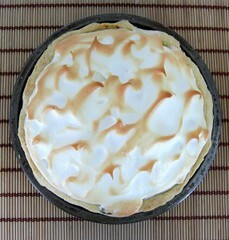 Pour into shell and top with meringue made with egg whites beaten with sugar and vanilla. Brown in slow oven 10 to 15 minutes at 325 degrees. Serenely well-read, I head for the kitchen to bake a pie. Rhubarb Pie Deluxe, of course.